At Wasserson Design, we design and install home automation systems that make your home more livable and your lifestyle more enjoyable. We make it easy to entertain friends, keep track of your property while travelling, or simply enjoy some down time with your favorite album. Imagine a home where lighting adjusts automatically to the time of day, music follows you from room to room, and a myriad of other options are available at the touch of a button. 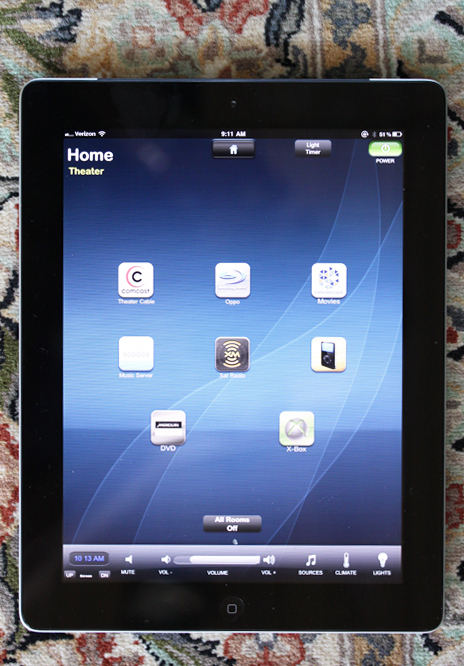 Adjust the temperature, set your alarm system for the night, or search your media library all from a simple, easy-to-use touchscreen or iPad interface. We can even program "hot buttons" that automate multiple functions with one touch. Imagine a "Party" button that adjusts the lights, lowers the shades, starts an MP3 playlist, and turns on certain TV's. A Wasserson Design home automation system can do all of this and more. Our process starts with a free consultation to talk about the many options that are available and identify your needs. Once our expert system designers have made their recommendations, our installation team carefully and precisely installs and programs each system. We fine-tune it for optimal simplicity, and show you how to use and enjoy it. So give us a call at 610-668-8000 to schedule your complimentary Home Technology Consultation. We're looking forward to helping you live in higher definition!